Now more than ever, dentistry is becoming a collaborative field. Doctors have always sought the advice of their closest colleagues when treatment planning complex cases. With digital technology at its peak, working with other dental professionals has never been easier. Dr. Timothy E. Mickiewicz utilizes BeamReaders®, an online diagnostic resource that provides detailed radiology reports for our patients. 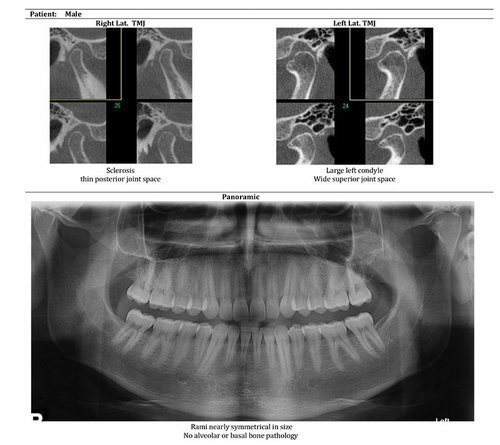 An Oral Maxillofacial Radiologist (OMR) is a professional who interprets dental cone beam scans and MRIs. These experts can offer services beyond the scope of general dentists and other dental specialists. Working from a sophisticated diagnostic station, an OMR can offer detailed, invaluable advice to doctors who are treatment planning complex cases. Oftentimes, their equipment can further enhance the images we obtain for an accurate and precise diagnosis. It is rare to have an OMR on staff at a dental practice. However, with the advent of cloud-based technology, we now have the benefit of a virtual team through BeamReaders. Not every case will require services by an OMR. However, whenever necessary, we are able to receive detailed radiology reports within three to five days. Rush orders can be completed in one day. Complex cases can even be evaluated by a team of up to 20 OMRs to ensure optimal accuracy and diagnosis. Oftentimes, we will send scans to BeamReaders to diagnose TMJ issues. Using the cone beam scan that we provide, they are able to identify sources of pain, analyze the airway, assess jaw growth, and evaluation your occlusion (the way your teeth fit together). BeamReaders will then send us a complete portfolio, highlighting their findings and making any necessary recommendations. In addition to TMJ disorder, BeamReaders can also diagnose orthodontic issues, airway problems, impacted teeth, and even pathology. In addition to unparalleled diagnosis, BeamReaders offers a Case Share feature. This allows Dr. Mickiewicz to share your records with other doctors on your team. In the past, film x-rays had to be mailed to another office, opened by a staff member, and placed on the doctor’s desk. Now, with BeamReaders, the images can be delivered instantly, right into the doctor’s e-mail inbox. In the modern age, patient confidentiality is vitally important. That is why BeamReaders cloud-based software encrypts all communication for your protection. No one will ever obtain your personal information, and no one will see your radiographs other than the doctors working on your case. Dr. Mickiewicz and any other dental specialist on your team will be able to access your records 24 hours a day, seven days a week for the purpose of treatment planning. That way, you are sure to receive fast, accurate, effective care. Technology has truly changed the way we do dentistry. What would have taken days or even weeks to complete just two decades ago can now be finished instantaneously. To find out more about the technology and techniques implemented at our practice, give us a call at our Sacramento, CA office. You can also contact a team member online.